UAVs are an intrinsic part of today's technology driven battlefield. Indians do not seem to be taking the challenge with the degree of urgency that is required, says Brigadier S K Chatterji (retd). Post the Doklam episode, the requirement of keeping our borders under greater surveillance have shot up skywards. The Indian Army was apparently utilising its fleet of Unmanned Aerial Vehicles (UAV) to keep track. It is possible to fly these machines on own side of the border at high altitudes, and yet be able to gather information of enemy activities across the borders. The unfortunate incident of one of the UAVs, an Israeli Heron, losing contact with its ground control station, and crashing on the Chinese side put the narrative in the public domain. UAVs can carry a diverse array of payloads for reconnaissance, surveillance, intelligence gathering and target acquisition. They can carry multiple payloads like electro-optical/Infra-Red cameras for daylight/day-night visuals, electronic and communication intelligence gathering payloads, and a host of others for battlefield and non-combat functions. Also referred to as drones, and now as Unmanned Aerial Systems (UAS), they are cost effective platforms. Over the years, UAVs have undergone a huge role expansion in employment with missiles being loaded on them to term them as UC (Combat) AV. These can be used for targeting surface targets as also underwater submarines. The UAVs have evolved from being primarily a surveillance and reconnaissance asset to hunter -killer roles. As far as India is concerned, the first acquisitions were the Israeli Searcher Mark 1 in 1998. It had its limitations in terms of altitude ceilings, endurance, duration it can be airborne, and weight it could carry. During the Kargil war of 1999, Indians felt the need for real time intelligence, acutely. The forces did not have adequate real time intelligence gathering resources. UAVs are the best and most cost effective platforms for intelligence gathering and especially so in a battle or Doklam like situations. The induction of UAVs received greater focus, post the Kargil conflict. In fact, India has been one of the leading drone importing nations till 2014. The Israelis upgraded their system to Searcher 2 and these were also contracted. They have been followed by Herons with the Indian Air Force leading, and the navy and army also deploying them. DRDO was already in the game when Kargil gave a jolt. The first of their products was Lakshya; basically a pilotless drone to serve as aerial target for the training of air defence artillery weapon crews. Thereafter, the DRDO story is a litany of lost timelines and failed projects. Lakshya was followed by DRDO's Nishant UAV programme in 1995. By 2011 four UAVs were supplied to the army. All four have since crashed with the army scrapping orders of any additional UAVs. DRDO's next major project has been Rustom. Three models were conceptualised. The first one was in the Medium Altitude Long Endurance (MALE) category, the next was in the High Altitude Long Endurance family (HALE), while Rustom H was to be an UCAV. It was to be fitted with Helina missiles, again a DRDO product. As it stands today, not one of these models have been inducted by the armed forces. The Defence Acquisition Council has also approved 598 mini UAVs for the infantry. These will be procured under the Buy Indian category of the Defence Procurement Procedure 2016, and give a boost to the private sector. They will substantially enhance the situational awareness of battalion commanders and provide information of activities in the area 5 to 7 km ahead of his position; a boon in combat situations. Amongst the latest acquisitions that India is pursuing are the Predator C Avenger of General Atomics, USA, for the Indian Air Force. During the PM's visit to the US in 2017, possibly the most important deal that the two sides signed was for 100 Predator Avengers. The Avengers incorporate stealth technology and can carry synthetic aperture radar. They are capable of flying with payloads of up to 1,400 to 1,600 kg and have an endurance of 16 to 20 hours. The jet powered model can fly up to 2,900 km and stay airborne for 18 hours. The weapons on-board include bombs and missiles. The Americans insist on trained pilots of manned aircraft, flying these UCAVs. An odd F 16 squadron has been converted to UCAV squadron and fly the Predators now. A deal for 22 Predators Guardian UAVs for the Indian Navy was also progressed during the PM's visit. A game changer according to some estimates, it will boost the Indian Navy's surveillance capabilities enormously. The models Indians are looking at are unarmed. The estimated cost is anywhere between $2 billion to $3 billion. The Americans are bound to insist on certain agreements before they dispatch their best products to India. Such agreements will include the Communication Interoperability and Security Memorandum and Basic Exchange Cooperation Agreement. It needs to be perceived that buying an UAV with greater endurance, higher altitude ceilings and ability to carry heavier payloads is not the bottom-line of a great acquisition. What matters equally is the quality of payloads they will be equipped with. In the conflicts in Syria and Iraq, American operators have been navigating their UCAVs from ground stations thousands of kilometres away effectively and attacking terrorist targets. It would be pertinent to study the progress of Chinese UAVs at this stage. The Chinese have made huge strides in manufacturing of UAVs. Its CH5 Rainbow -- considered an equivalent of MQ 9 Reaper, the same family as the Predators -- is being mass produced. The Chinese are proving tough competitors for the Americans in the global market. Saudi Arabia has signed a deal with the Chinese to produce drones. The CH4 is half the price of the MQ 9. Even Iraq has opted for Chinese UAVs. At the September 2017 Aero Expo in China, UCAV models were on display. Among them were twin engine models with a plethora of weapons. These models were all displayed for marketing. They have also developed UAVs for strategic reconnaissance. The Chinese have also a range of UAVs for civilian use with models being produced by their universities and research laboratories. They are way ahead of Indian endeavours in the field. Amongst technologies yet to be fully deployed are using multiple UAVs in a swarm. While there could be a few UAVs in the swarm that will be high end versions, the others will be cheaper but adequately equipped to follow the leader. The swarms will carry lethal payloads and will saturate enemy defences adequately for an attack to be successful. The Chinese have claimed the launch of the biggest swarm so far of 119 UAVs in June 2017. The previous record was the American launch of 103 micro UAVs from three US Air Force Boeing F/A 18 aircraft in October, 2016. Unmanned military platforms are an intrinsic part of today's technology driven battlefield. Loitering missiles with payloads to destroy opportunity targets or pre-planned objectives are also available; Indians have the Israeli Harop. These unmanned platforms are being tried as aerial, land and undersea platforms. Combined with artificial intelligence they will transform the battlefield in the days ahead. Indians do not seem to be taking the challenge with the degree of urgency that is required. A technologically advanced force can pulverise larger and less modernised force before it destroys it in detail and obtains territorial possession that still remains the litmus test of dominance. India has a window available to modernise its inventory before the Chinese military modernisation goes above a certain threshold that ably supports their belligerence with adequate teeth. Fortunately, the Chinese have extended their objectives too far and too wide as compared to their military prowess. Is Taiwan going to be their priority? Or stemming India's rise? Chinese claims in the South China Sea require massive resources. Is the great game of Belt and Road Initiative also not a great gamble! Progress in inventory modernisation of the Indian armed forces can only be possible when the bureaucracy, users -- the services -- DRDO and defence PSUs come together along with the private industry. Of all these elements, the services are the most important and need committed leadership and focussed officers with experience and competence in their acquisition offices to constantly drive their projects forward. 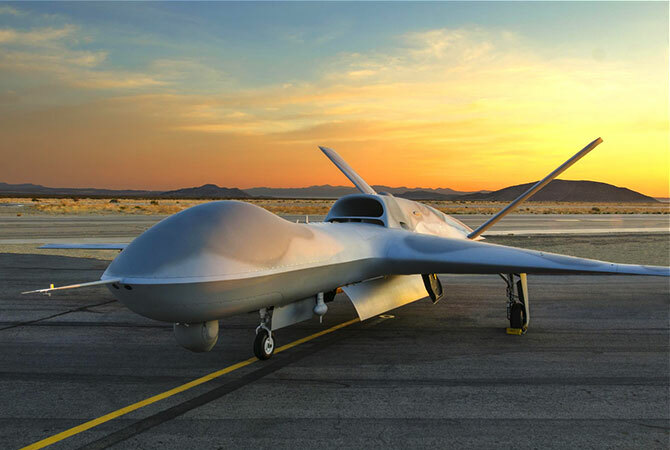 IMAGE: The Predator C Avenger Remotely Piloted Aircraft. Photograph: Kind courtesy General Atomics Aeronautical. Are we ready to fight the wars of the future?